Ahmad, a first-year MSc student at the School of Biotechnology, went missing on October 15 after alleged scuffle few ABVP members. NEW DELHI: The students of Jawaharlal Nehru University protested against the police over missing student Najeeb Ahmad near India Gate in the national capital Delhi along with Ahmad’s family members on Sunday forcing Delhi police to lose all the roads leading to the India Gate. The Delhi Police had imposed CrPC Section 144 (prohibitory orders against unlawful assembly) in the area following which all the students and even the mother of the missing student were detained. Ahmad, a first-year MSc student at the School of Biotechnology in JNU, went missing on October 15 after alleged scuffle few ABVP members, who had gone campaigning to his room for hostel elections. The Delhi police detained JNU students who were protesting the lack of action taken by the authorities. Ahmad’s mother Fatima Nafees was also detained. Seeing this, the Delhi Chief Minister Arvind Kejriwal went to Mayapuri police station where Fatima Nafees was detained. Even before Kejriwal, reached the police station, Fatima Nafees was escorted to her relative house at Jamia Nagar in a police van. The JNUSU had been protesting for the last 20 days. Student leaders have also accused the ABVP of being involved in the incident but the Delhi police have refuted such accusations and claimed they are trying to trace Najeeb. The police have also announced a Rs 2 lakh award for anyone with credible. 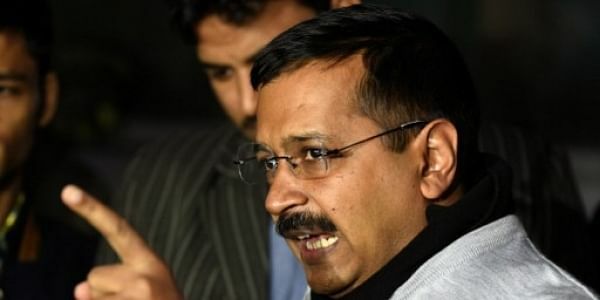 Kejriwal alleged that the Centre was adopting ‘dictatorship’ policy and violating the constitutional right of an individual by adopting such measures. He also stated that met President Pranab Mukherjee and gave the two-page letter to him urging to intensify the search operation. Kejriwal said that President has assured that he will seek a report from the Ministry of Home Affairs and the JNU administration on the missing student. The Chief Minister called on the President. He said he apprised Mukherjee of the matter. He also alleged that the Delhi Police did not take any action in the matter due to "political pressure". “People who were involved in the brawl with Najeeb were questioned by the police yesterday, 22 days after he went missing. That was also a formality. We have apprised the President of the matter. He has assured us that he will seek a report from the Delhi Police and JNU in this regard,” Kejriwal said. On November 3, while speaking at a solidarity meeting on the JNU campus, Kejriwal had accused Delhi Police of not probing the matter properly. Kejriwal, who has had frequent run-ins with the Delhi Police, had said it will not dare to pursue any investigation in this regard as RSS' students' wing ABVP was involved in the brawl. The Delhi Police has formed around 50 teams to locate Ahmad. The police teams have been knocking the doors of Madrasas across the national capital, Uttar Pradesh and Rajasthan and police have also been deployed in Jamia, Delhi and Aligarh Muslim Universities. In the meantime, BJP accused the AAP and Congress of "orchestrating" the protest by JNU students at India Gate, saying they cannot digest the "good work" done by the Narendra Modi government. BJP National Secretary Shrikant Sharma said the party prays that JNU student Najeeb Ahmed, who went missing since October 14, is found safe, adding that it was "tragic" that he could not be traced yet. "The police permission was taken for Jantar Mantar but they have intentionally gone to India Gate where Section 144 of CrPC is imposed. Arvind Kejriwal had gone to (JNU) campus a few days back and influenced the students to take this step," Sharma alleged.